I have recently finished reading a fascinating article. One of the problems of treating glioblastoma is that it comes back. Remember that glioblastoma is a malignant tumor. When the tumor does come back, it comes back with vengeance and it makes it more difficult to remove the new tumor that has been formed. The cancer cells that are involved in recurrence of gliomas is glioma-initiating cells (GICs), also note that GICs are also involved in the initiation of gliomas. Ideally the best therapeutic drug to stop glioblastoma is to target the GICs. However little is known of the molecular mechanism of the GIC. The paper’s initial hypothesis is that TGF-β and LIF have role in the regulation of GICs in glioblastoma. TGF-β is an interesting protein because in normal epithelial cells it acts as an antiproliferative factor, a tumor suppressor. However in glioblastoma the protein becomes an oncogenic factor. Leukemia inhibitory factor (LIF) is a protein in cells that affects cell development and growth. 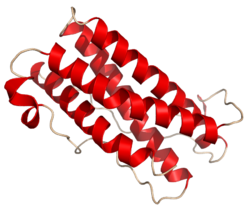 The image is of a LIF protein. Both proteins, TGF-β and LIH, are factors that promote the longevity of cells even cancer cells. If these proteins are present in glioblastoma then is understandable to see how GICs would use the proteins to form tumors and the reoccurrence of tumors. The conclusion te of the paper is that GICs self-renewal increases because of the LIF-JAK-STAT pathway. Authors of the paper also found out the using anti-TGF-β compounds inhibit the LIF therefore decreases GICs self-renewal. After reading the paper, I was pretty impressed that a piece of the puzzle has been found for glioblastoma. Also I have a few questions and I want to read your thoughts on it. For one thing when making a therapeutic drug, should the drug only have one target or multiple targets? Remember that there is a chance that the therapeutic drug could not only damage the cancer, but also the normal cells. Another question is why does the recurrence of glioblastoma come back stronger? The answer is not meant to be heavy in molecular biology. Last question, are there other cancers where the recurrence of the tumor are stronger like glioblastoma and does the recurrence of the stronger tumor is the same mechanism that is seen in glioblastoma?